Home » » HUNGER STRIKE UNTO DEATH-Release Fishermen from the Indian Jail. HUNGER STRIKE UNTO DEATH-Release Fishermen from the Indian Jail. Ven. Bandiwewa Diyasen Thero have started a fasting protest against long term imprisonment of six fishermen in Andaman island by the Indian government without court action. The Protest has started Morning hours of Tuesday 25th Oct. in Sri Samuddrasanna viharaya, kandakuliya village in Kalpitiya. (About 140km from colombo). Ven. Yatimadura Manasalankara thero and 65year old G.D. Leelawathi, mother of 3 also participating to the fasting protest, one of her son have died during a fishing operation several years before, and other two have been jailed for about one and half years by the Indian Authorities. 65 yearold mother refused to admit to the hospital telling that, she have no way to live without her sons, and she signed to a letter saying that, her self decided to stay till death or till sons return, after informing the situation by the doctor. six fishermen who started to sail their multi day fishing craft named Sachin 2, from Trincomalee fisheries harbor on 28th February 2010, have arrested by the Indian Navy by March 09th 2010, accusing illegal crossing and entering of Indian sea area and fishing in Indian waters. one of the victim suffering from high blood pressure and another with week mentality, according to family members the patients in the jail, not receiving proper treatment. The Strike previously planned to start by 26th Oct. have been stared early today (25th Oct) due to arising pressure from several ways to the organizers to stop it. 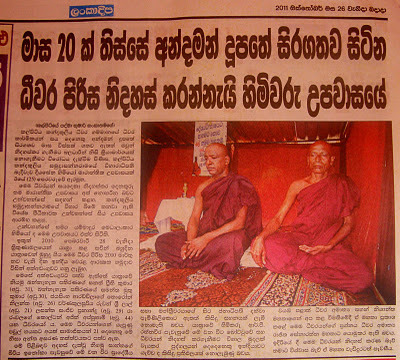 Ven.Bendiwewa Diyasena thero and ven. 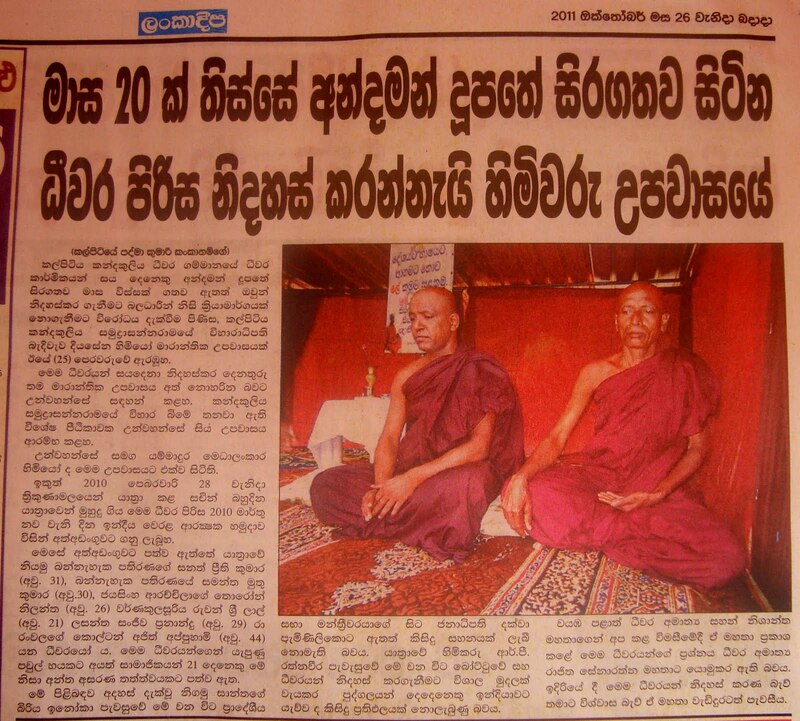 Yatimadura Manasalankara thero giving lead to the strike. 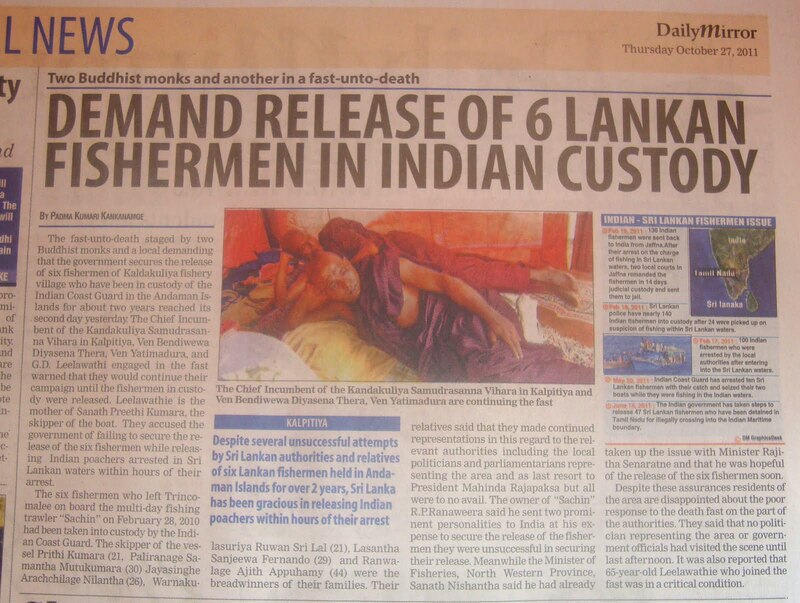 When Indian Fishers caught by SL Navy, they are releasing within 3 working days, Why they can't release ours, asking the victimized family members. Indian fishermen destroying SL Northwestern sea area daily, by thousands of trawlers and Sri Lankan fishermen getting caught once in a while by entering to Indian territory. There should be fair law to Sri Lankan fishermen in India too, They expecting and acting to get released Indian fishermen as soon as possible when they get caught, even pushing the government, and even law enforcement institution directly, why they holding our family members? They have suffer more than they deserved asking the family member of the victims in Andaman jail. The protesters and family members asking the SL government to get involved to the scene with strength and get released Lanken fishermen from the Andaman Jail as soon as possible, as they acting on Indian poachers, without telling lies to the suffering people. Strike will continue till death or till release the fishermen. and family members also giving warning to the authorities of two countries saying that, "if someone gone, there will be more disaster than they expect"